Rent a Car Pakistan, Car Rental Pakistan, Rent a Car in Pakistan, Rent a Car in Lahore Islamabad Pakistan up to 60% Off, you can book online your desired vehicle Cultus, Honda, Toyota XLI-GLI, Suzuki APV, Toyota HIACE, or AC Saloon Coaster along with driver for as many days you require. Weekly or monthly discount will be automatically applied. You need to confirm your booking by paying reservation charges within 3 days of getting quote. You can pay via cash, ATM, online bank transfer or western union. Fuel Expenses & Toll Taxes are not included in the rental rates. Chauffeur’s duty timing is 10 hours/day and RS:100/hour overtime will be charged for cars. In case of vehicle fault, PakTrip.com will replace vehicles as soon as possible. In case of accident/mishap PakTrip.com is not responsible for any casuality, injuries or any damage. Vehicle / Day duration is 12 hours and night 50% will be charged of the daily rent. Payment Method Rent a Car Pakistan, Car Rental Pakistan, Rent a Car in Pakistan up to 60% Off: You will pay confirm your booking, witin 3 days. 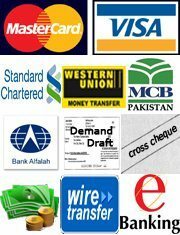 You can pay in Pak Rupee in cash upon pickup at rental start date or by using the following payment methods include Cash, Cross Cheque, Wire Transfer, Western Union, Money Gram, Demand Draft, Online Bank Transfer, Residents of Karachi, Lahore, Islamabad and Rawalpindi can also pay via cash or cross cheque to be picked from their doorstep. You can also use the currency converter which is shown in the right side of the website, by using this you can easily convert any type of currency in each other.